Come discover the wonders of nature at Sugar Magnolia! 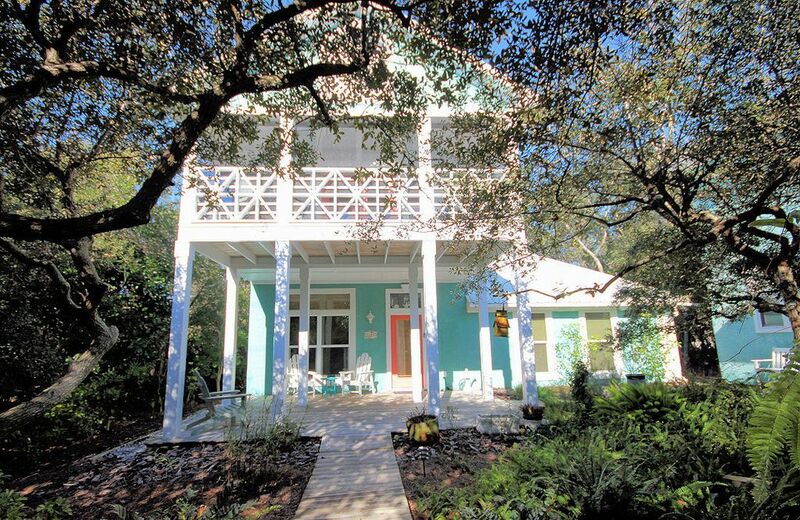 Nestled among a canopy of salt spayed live oaks, and magnolias, Sugar Magnolia is a gem of a house which sits within a 1-minute walk to the beach. Enjoy this colorful property, in a small neighborhood next to Grove by the Sea, on Scenic 30-A, in the coastal community of Seagrove Beach. Sugaree, the guest cottage for Sugar Magnolia is also for rent. Providing plenty of room for 8 guest, this 3 Bedroom / 2 Bath home has 3 decks and a private pool. Like many beach villas along the panhandle, this beach home enjoys a reversed layout with 2 bedrooms downstairs and the main living space, kitchen and master suite upstairs. Awaken to a courtyard garden and open the doors to enjoy your morning coffee on your private deck. Upstairs is the large king master suite complete with flat screen TV, private desk and master bathroom which features a designer shower and dual sink vanity. The gourmet custom stainless-steel kitchen wraps around an oversized island that provides seating for 4. The open family room with a dining space that seats 6, also features dual sofas, flat screen TV, soundbar and extra seating on the perimeter of the room which allows the whole family to enjoy this beach home the way it was meant to be enjoyed…together. French doors take you out to the porch, which is surrounded by property’s live oaks, providing for outdoor seating and dining in treehouse like setting as you enjoy the coastal breeze. The guestrooms downstairs boast a bunk room with dual bunk beds that sleep 4 comfortably. The second guestroom offers a queen bed, flat screen TV and a sliding glass door that will take you out to the pool deck. Both rooms share a downstairs soaking bath/shower combo, with a dual sink vanity and a separate makeup vanity. A large pool deck offers plenty of space for lounging poolside and an additional dining table and grill makes this a perfect place to chill and relax outside. Walk or bike to nearby shops and dining in Seagrove, Seaside and Watercolor. Enjoy fishing, paddle boarding, canoeing, and kayaking, or just kick back and drink in the sunset as you bury your toes in the sand. Beach access is directly across the street, and about a 1-minute walk. We purchased this wonderful property for our family, friends and guests to enjoy. After traveling to the 30-A and Seaside area over the past 4 years, we knew this was the stretch of beach and place to have a beach getaway of our own. There is no doubt that we found the most unique and peaceful place on 30-A, as the property nestled among a shady grove and a minute walk to the glorious white sand beaches and 25ft dunes of 30-A. We feel that Seagrove along with the other beach communities (Seaside, Rosemary Beach, Alys Beach, & Grayton Beach) along Scenic 30-A, are some of the most beautiful beaches in the world. There always seems like there is something to do for everyone during all times of the year. Past guests have described this property as the perfect place to renew and reconnect. The main house and cottage have all the benefits of fully stocked home, while also offering HD-TV, with flat screen TV's in every room, and Wi-Fi internet service though out the property.